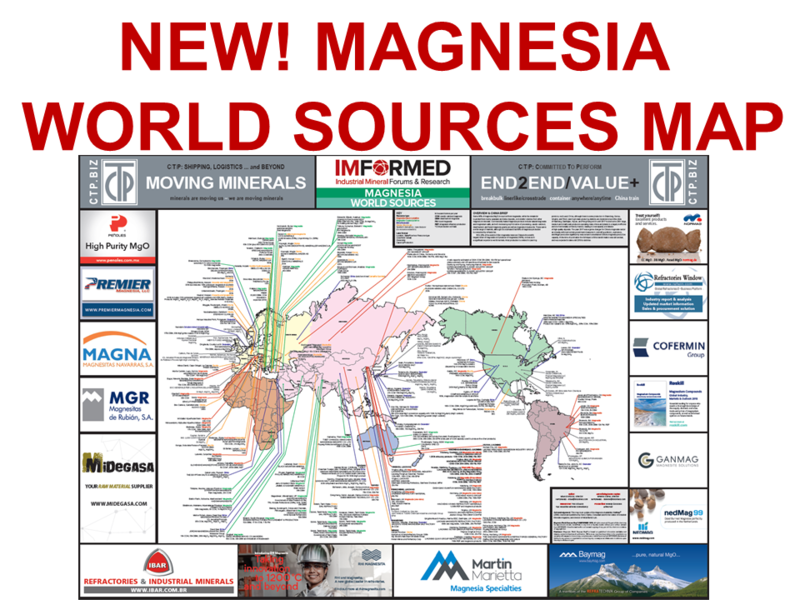 Industrial Minerals Networking | IMFORMED – Fluorspar outlook: a new era dawns? These discussion points and many others will be under the spotlight at IMFORMED’s Fluorine Forum 2018, Madrid, 15-17 October 2018. 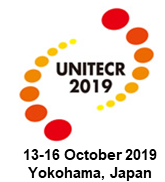 Over 100 leading players are gathering to network and listen to an expert panel of speakers covering supply and demand trends in the fluorine raw materials industry. Plus we will have the acclaimed Keynote Discussion Panel that was so popular in Fluorine Forum 2017 in San Luis Potosi (for a review see: Fluorspar feelgood factor in Mexico). New to Fluorine Forum 2018 will be our Roundtable Networking Session where delegates are invited to take coffee in a relaxed, informal networking and discussion session, to share and gain insightful knowledge at themed round tables hosted by leading experts. 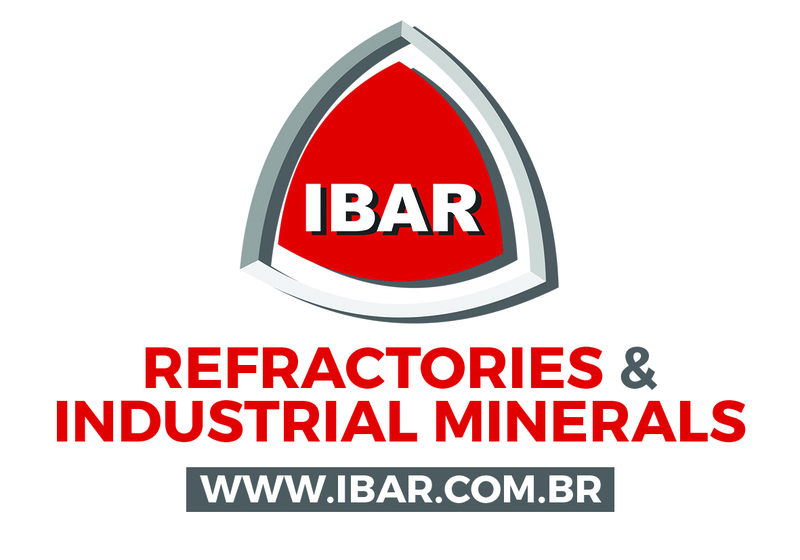 Any industrial mineral market which is dominated by China, and fluorspar is no exception, will have experienced 2017-18 as a milestone year having been subject to widespread disruption in supply owing to an ongoing series of robust environmental, safety, dynamite, and business practice controls. 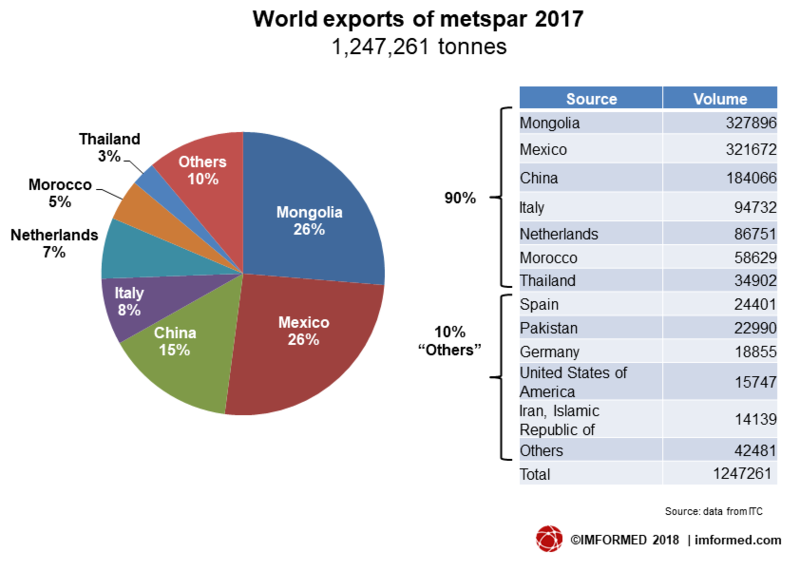 It is understood that Chinese metspar supply suffered more than acidspar, and this trend is expected to continue into 2019. Historically, China has been such a dominant force in global fluorspar supply, however its export volumes are expected to continue to decline (see charts). Of significance will be the growing expectation of increased imports of fluorspar to China from Mexico and South Africa in the near future. Certainly, supply of Chinese grades into Europe was very tight during H1 2018 and prices were ranging US$450-$540/tonne FOB with smaller shipments reaching even higher levels. With fluorspar prices climbing to six-year highs in 2018 following fluctuations at low levels during a long period of oversupply, new and developing fluorspar suppliers are sensing an opportunity to break into the market. 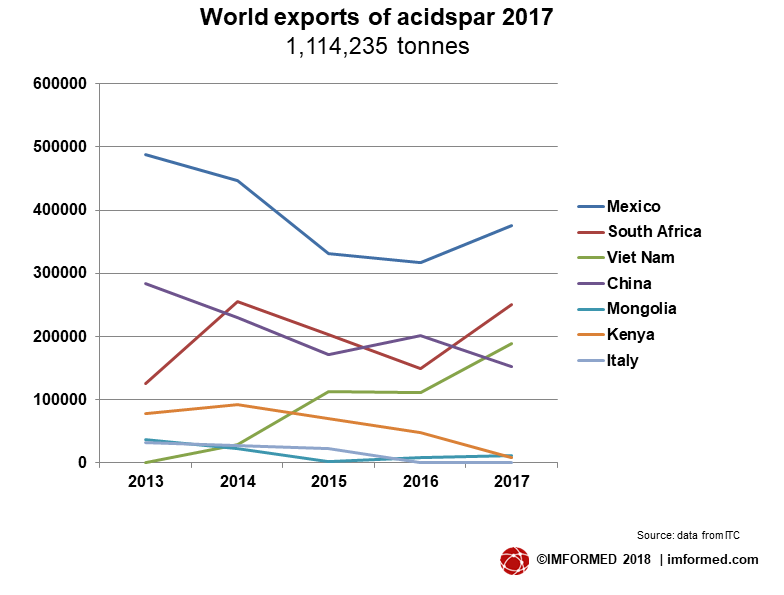 Combined with an overall loss of some 800,000 tpa of acidspar production capacity since 2009, and anticipated closures and interruptions in future Chinese supply, new players are in a buoyant mood. While there are continued murmurings of limited US, Namibian, and Kenyan supply rejuvenating, and Asian sources in Pakistan, Afghanistan, and Thailand showing promise, not to mention a possible new AlF3 source in Australia, and the tireless efforts of Tertiary Minerals to kick-start operations in Sweden (and Norway and the USA), the spotlight is firmly on Canada and South Africa. No doubt inspired by the now established (albeit long awaited) entry of Vietnam’s Masan Resources into the market, whose acidspar exports have increased from 30,000 tonnes in 2014 to almost 200,000 tonnes in 2017, Canada Fluorspar Inc. and Sepfluor Ltd appear to be heading the pack. Canada Fluorspar, which was supposed to be in production in Q4 2017, is apparently looking to 2019 for a ramp-up in production. The company appointed new CEO Bill Dobbs in August 2018. Early August 2018 saw its first commercial shipment of 4,700 tonnes leave Marystown port, Newfoundland, for Houston, USA. 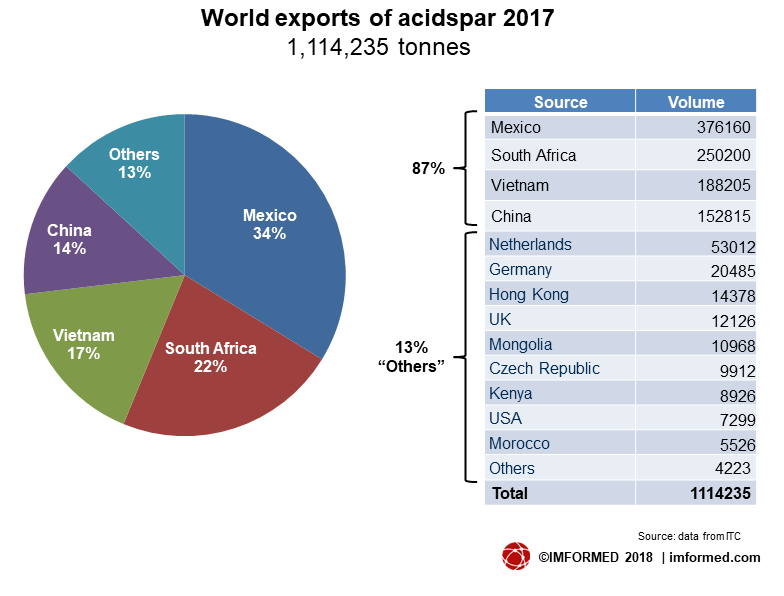 With a nominal target of full production capacity of 200,000 tpa and a mine life of 30 years, this could represent a major new supply source, perhaps a potential 10% of world acidspar capacity outside of China. However, just how soon commercial scale production is achieved remains to be seen; the Newfoundland fluorspar source has had a chequered and challenging history (see Fluorspar revival in Newfoundland). Sepfluor’s Nokeng project comprises three adjacent, high-quality haematite-fluorspar deposits; Plattekop, Outwash Fan and Wilton. The former two host an estimated total mineral reserve of 12m tonnes (Plattekop: 2.7m tonnes at 40% CaF2; Outwash Fan: 9m tonnes at 23% CaF2; see Fluorspar renaissance rallies in South Africa). 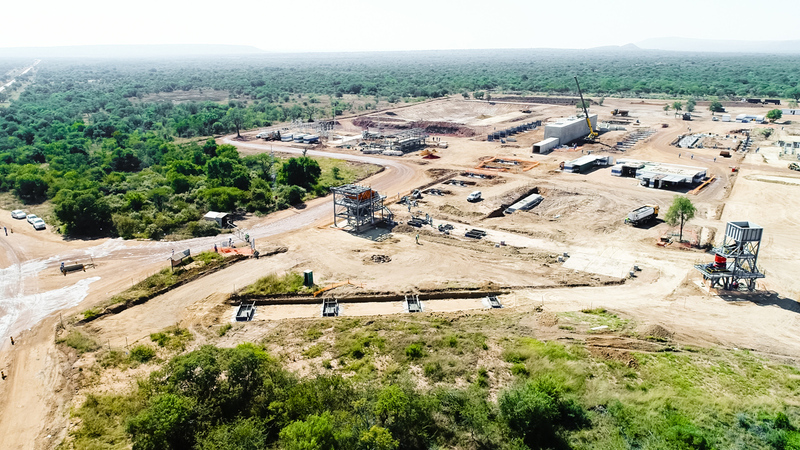 Q1 2019 production is envisaged at 630,000 tpa crude ore, with 180,000 tpa of acidspar production for sale and internal processing, and up to 30,000 tpa of metspar for local and export steel markets. Nokeng’s construction phase is expected to be complete in late October 2018 with commissioning following soon after. First shipment is expected in January 2019 with official plant completion and handover from the contractor expected on 7 February 2019. Presentations and discussion on the above topics will be central to the programme at Fluorine Forum 2018, along with the latest developments in markets driving demand for fluorine raw materials including fluorochemicals and steel, as well as cost factors such as logistics, processing, and sulphuric acid input.